NEW YORK/SEOUL, Sept 30 (Reuters) – The first U.S. export of Alaskan crude to South Korea in more than a decade set sail at the weekend, according to a company source and shipping data, marking another milestone as booming shale oil output forces domestic drillers to seek new customers. The Suezmax Polar Discovery loaded at the Valdez terminal in Alaska late last week and was due to arrive next week in Yeosu, South Korea, according to shipping data available on Thomson Reuters Eikon. South Korea’s second-biggest refiner GS Caltex Corp will receive 800,000 barrels of Alaskan crude on October 10 after purchasing the oil on the spot market, a company source told Reuters. It was the first exported cargo of Alaska North Slope (ANS) crude, which is largely excluded from a 40-year U.S. ban on oil exports, since 2004. U.S. government data showed it was the first crude oil exported to South Korea since 2000, excluding a recent cargo of lightly processed condensate exported from the Gulf. Caltex also bought the condensate cargo. A spokesman for ConocoPhillips, one of the major producers of Alaskan crude, said the company had sold a cargo of ANS to Asia, but did not reveal terms of the deal or confirm if it was the Polar Discovery. The sale would “enable the state of Alaska and ConocoPhillips to potentially realize a higher value” for the oil, spokesman Daren Beaudo said. The shipment will likely intensify pressure on President Barack Obama’s administration to ease the longstanding export ban, which some analysts say would help lower global fuel prices. The export exemption for ANS was created in 1996. The source at GS Caltex, a joint venture between GS Holdings and Chevron Corp, said the refiner bought the crude at competitive prices but did not elaborate. Bids for the crude from Asian customers were higher than those from U.S. West Coast customers, Genscape, an industry group that first reported the shipment, quoted an unnamed Conoco official as saying. Last week a 900,000 barrel cargo of ANS crude for domestic delivery sold at the lowest price since June 2012, at $2.25 a barrel over U.S. crude futures for November delivery, according to traders. President Bill Clinton signed legislation in 1996 that ended a 23-year-old ban against exporting ANS crude. Oil production in Alaska had swelled from almost nothing to more than 2 million bpd over the decade to 1988, overwhelming demand. Within five years, Alaska exports to Asian countries ran at around 44,000 bpd, Energy Information Administration (EIA) data show. But exports to Asia ceased in 2004, after ANS production began to decline and the surplus dwindled. Alaskan output totaled 526,000 bpd last year, the lowest in 25 years. Now, U.S. West Coast refineries that process ANS crude are filling their slates with more inland crude. In Asia, South Korean refiners faced with weak margins want to cut costs by diversifying away from their traditional crude suppliers in the Middle East. 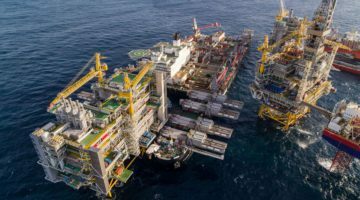 Earlier this month, GS Caltex received the first cargo of ultra-light oil, or condensate, from the United States since the softening of the U.S. ban, and South Korea’s biggest refiner SK Energy Co Ltd is also expecting U.S. condensate soon.